Today, Thanksgiving Day, is one that is set aside for doing something we must do daily and that is to express our gratitude for who we are as it relates to God; what we have because of His favor, mercy and grace; and the wonderful gifts of the capacity to think, feel, and love. This week in our Master Key Mastermind reading we continue examining this capacity to think and reinforcing our commitment to begin each day with love in our hearts. You say grace before meals. All right. But I say grace before the concert and the opera, and grace before the play and pantomime, and grace before I open a book, and grace before sketching, painting, swimming, fencing, boxing, walking, playing, dancing and grace before I dip the pen in the ink. ~G.K. Chesterton What things might you begin saying grace before? 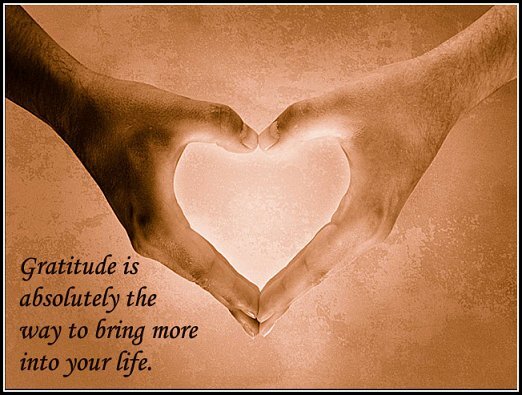 Gratitude yields joy, a sense of peace and a flooding of love. Gratitude indeed pays dividends!! You are correct, we need to always remember to give thanks for everything and everyone. My favorite quote that you added was “You say grace before meals. All right. But I say grace before the concert and the opera, and grace before the play and pantomime, and grace before I open a book, and grace before sketching, painting, swimming, fencing, boxing, walking, playing, dancing and grace before I dip the pen in the ink. ~G.K. Chesterton What things might you begin saying grace before?” We don’t give enough tanks and gratitude in our lives and we should remember to do so at every moment we have. Thank you for helping us to keep our thanks ever present and arming us with good thoughts to keep the positive in front of us. I enjoyed your gratitude quotes. They reminded me of Hymn #3 in the Christian Science Hymnal. The first line is: “A grateful heart a garden is, where there is always room for every lovely, God-like grace to come to perfect bloom.” Let’s keep blooming! Thank you for posting such a lovely reminder to stop and be thankful for EVERYTHING! Without stopping to look, I do forget to notice that my entire life is a gift. Thanks for commenting on the degrees of gratefulness as i can tell you have a heart full of love & full of gratitude for the small and the large things in your life !